The Outer Banks has been dubbed the "Kite Boarding and Wind Surfing Capital of the East Coast." The steady and consistent winds, temperate weather, shallow sound waters and rolling ocean waves – all provide great opportunities for both novices and extreme sport enthusiasts alike. 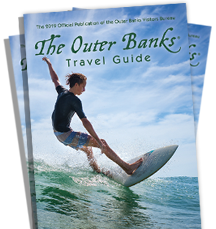 Even professionals flock to the Outer Banks every year for the Triple S Invitational – the foremost freeride kiteboarding event in the world held yearly in Cape Hatteras. But for the rest of us, during the summer, the warm, friendly and shallow flatwater of the Albemarle and Pamlico Sounds offer world-class learning conditions for building windsurfing skills with lessons. Plenty of world-class instruction from expert local instructors and technical advisors is available throughout the Outer Banks.